Archmere Academy | Caroline Quinn '17 Cast as Lead in "Thoroughly Modern Millie"
Caroline Quinn '17 Cast as Lead in "Thoroughly Modern Millie"
Caroline Quinn '17 has been cast as the lead (Millie) in Thoroughly Modern Millie, which will open at the Broadway Theater of Pitman in Pitman, NJ this June. 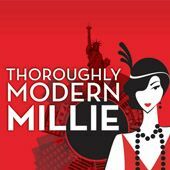 The musical comedy tells the story of a small-town girl who comes to NYC in 1922, excited to enter the workforce. Reviewed as "Over the top, comic pastiche, this show is colorful, bright and filled with exciting dance numbers," the musical runs from June 28th through July 21st, 2019.